What Are the Benefits of Eating Canned Corn? 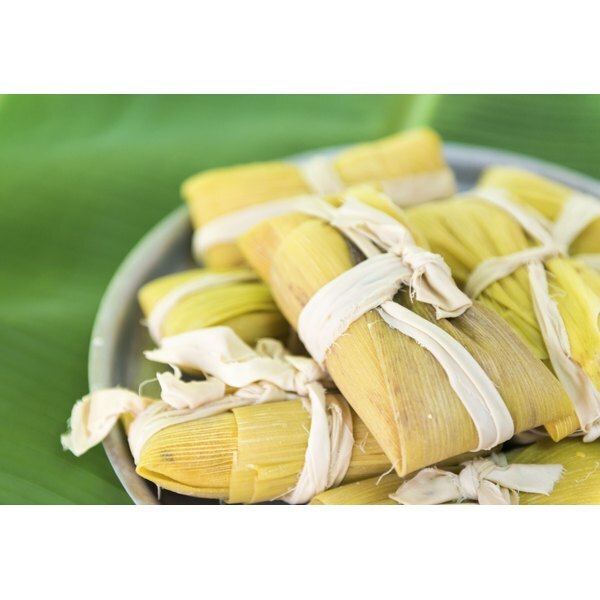 Traditionally wrapped in corn husks before being steamed, corn tamales are a Latin American dish made from pockets of corn dough that encircle a filling of meat and salsa. Calories in corn tamales come primarily from carbohydrates. Corn Tamales has 177 Calories and 7.08 g of Protein per 100 gram serving according to the nutrition facts provided by the USDA Food Composition Database. Three homemade corn tamales with a side of avocado-tomatillo salsa contain 297 calories, reports MayoClinic.com. One commercially produced sweet corn tamale contains 290 calories. One serving of three homemade corn tamales has 7 g of protein, 11 grams of total fat, 1 g of saturated fat, 49 g of carbohydrates and 7 g of fiber. A commercially produced corn tamale has 3 g of protein, 9 g of total fat, 4 g of saturated fat, 49 g of carbohydrates and 1 g of fiber. Reduce fat calories in your corn tamales by moistening the cornmeal with pureed corn instead of oil or lard, suggests Steven Raichlen, author of “Steven Raichlen’s Healthy Latin Cooking.” Use lean ground chicken or beef if you’re making a meat-based tamale filling. Increase fiber, vitamin A and vitamin C by including plenty of diced sweet bell peppers and tomatoes in the filling or alongside your corn tamales in a homemade salsa blend.